Why an unexpected customer experience creates powerful word-of-mouth. The difference between how you think you impact your brand and how customers experience it. How you can take a page from the Cubs. An opportunity to learn more about customer experience. We talk a lot on the show about getting the little things right because when you make something remarkable that is completely unexpected you get people talking. When Dan was at the Social Media Marketing World Conference in San Diego, he had an unexpected customer experience in the restroom, of all places, that he’s still talking about. If someone can make an experience out of a urinal, you can make an experience out of your business. Customer experiences can occur absolutely anywhere. Get creative: sometimes the most unexpected experiences are the most remarkable. This week, we’re looking at Jennifer King’s article, “Brands and Consumers Differ on What Makes a Poor Brand Experience.” InMoment surveyed 2,000 internet users and 1,000 US brand professionals, and the results showed that brands don’t seem to be in touch with what consumers are thinking. Customers feel that staff makes a significant impact on the customer experience, while brands significantly underestimate the impact that employees can have. Brands must talk with and listen to their customers to understand their needs and pain points. Customer service remains a key piece of the customer experience puzzle. Understanding that you need to do better is the first step. Do simple better, reduce the number of interactions, reduce the friction points, create an unexpected customer experience, and wherever you can simplify is a place to improve. Simple is good for everyone, the simple solutions free up time for your employees that would otherwise have to spend explaining things. 45% of attendees of a recent Oracle CX webinar believed that customers want more, but that those expectations are reasonable. So if so many companies recognize that they need to do more, why are we waiting to start doing it? Oracle’s Modern Customer Experience Conference is coming up in Chicago, April 10-12, where you can learn more. Attend the Oracle Modern Customer Experience Conference to learn how you can do create an unexpected customer experience and more. Jay Baer: Hey everybody this is Jay Baer, founder of Convince and Convert. Before Joey and Dan kick off the show I wanted to tell you about some of the other sponsors bringing you experience this week in addition to our friends at Oracle CX Techsmith. Techsmith makes it super easy to create professional videos and images with leading tools like Snagit and Camtasia, which we use all the time. Everyone can take custom screen shots, screen cast and videos, you don't have to be a graphic designer, you can do it yourself. If you need to share campaign results with people who aren't familiar with what a CTA is, a PPC, an SERP, you can use Snagit to capture those results and share them out as screen shots. Super easy to use. Incredibly, incredibly powerful. Visit techsmith.com/experiencethis for a free download. Techsmith.com/experiencethis. Now, here's Joey and Dan with this week's Experience This. Dan: Get ready for another episode of the Experience This Show. Join us as we discuss how even a public bathroom can become an experience. Why brands and customers are still not seeing eye to eye. And how the simplest answer, is often the best answer. Being. Agreeing. And foreseeing. Oh my! Dan: Alright Joey, so we talk a lot on this show about making sure you get the little things right. The things that your customers may not even be expecting you to pay any attention to, but when you do and when you make something remarkable that's completely unexpected, it is something that people talk about. And I wanted to share with you an example of this that really blew my mind. So at the beginning of March I was in San Diego for Social Media Marketing World. And I know you know the conference very well 'cause we met for the second time. Joey: We re-sparked and re-ignited our long distance relationship when we saw each other many years after our first meeting when we re-connected at Social Media Marketing World. Michael Seltzer puts on a heck of an event. It's awesome. Loved attending that last year. Dan: ... every year for the opening night party, they rent out the USS Midway, which is a retired aircraft carrier. It is, of course, gigantic. And it's a great place for a party, frankly. Lots of room for food and walking around. You get to go see some of the planes and they have lots of people demoing things. It's very very cool. Joey: Woohoo, my kind of party. Dan: Yes, I found myself eventually making my way to the bathroom. And I've been in this place now five times. And so I kinda knew what the bathroom looked like and I was very surprised when I walked over to the urinal. Joey: Not exactly sure where this is going, but alrighty. Dan: I wanna warn some of our listeners here, we're going to be talking about bathrooms for a moment here. And then we promise we'll get off it quickly. 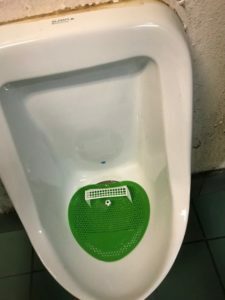 But the interesting thing about this urinal is the bottom of the urinal was green and there was a plastic soccer goal that was in the bottom of the urinal and a ball that was hanging from a string. So use your imagination here, Joey, the soccer balls hangs from the string. Joey: Right, I get it. I get it. I'm tracking. Joey: When you use the restroom for what it was intended for you can move the ball. Dan: Yes. And so obviously, this is something different and even though you're not supposed to do these kinds of things I obviously took out my camera and took a picture of it. Dan: So well have it in the show notes guys. Joey: Ladies and gentlemen, live from the San Diego Country jail, Dan Gingiss. Dan: So, why am I talking about urinals, Joey? Joey: That's a really good question, I'm listening to. Dan: I think I've lost even my co-host, here. So what I thought was remarkable about this, was this was an experience that even a customer experience guy was surprised by. And you walk into the bathroom and you just expect to do your thing and walk out. And somebody thought enough to create an experience out of a urinal. And that, to me, was just unbelievable. I mean, who would do that? And why would they do that? But it got me thinking, and I actually ended up in my presentation at Social Media Marketing World, I ended up putting up a picture of said urinal. And I asked the audience if somebody can make an experience out of a urinal? 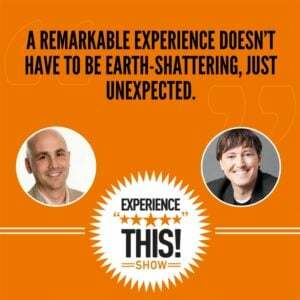 What can you do to make an experience for your business? And after all the laughter died down, people started nodding their heads. Joey: Yeah, and I can definitely see that because ... and folks listening at home are listening along as you drive or workout or wherever you enjoy listening to Experience This. This isn't ... and I get your point, Dan. This isn't about the urinal. Right? The point of this story, in case you missed it, is every single interaction, the most minute details of the interactions you have with your customer, are an opportunity for you to create something remarkable. An opportunity for you ... but the very definition of remarkable is worthy of talking about. And ironically enough, that's what Dan is doing, right? He had an experience that was so shocking, that was so different, that was so unexpected, that he has to tell the story. Not only during his presentation at the even the next day, but here on the show sometime later. So moral of the story, I think for all of us, what are the little aspects of our business that are potentially overlooked, that by paying a little more attention to, we can create a magical moment or something that really captures the attention or the eye of our customers. Dan: Yeah, I agree, Joey. I think that, again, what made this so interesting to me was I wanted to meet the guy, or gal, who created this. I wanted to bring that person to my business and have them look at everything that we do and see if they could use that same creativity in different areas. You know, I think if you didn't say this, you probably implied it. These things don't have to be expensive either. I remember recently we talked about the metro train and the little piece of paper they give people when they're late, that costs almost nothing. And yet, it drastically affects the experience. I don't want people to think they have to go out and spend lots of money to do these kinds of things, but I do think that you have to spend the time to put yourself in the customer's shoes, understand where they're gonna go if it's a physical location, where they're going to go if it's a business, if it's a digital location. Every page of your website is an experience. Or your mobile app. And I think that's the kind of attention to detail that you and I are always preaching in the show. Joey: Absolutely. And I think it's one of those things where this doesn't have to be an earth shattering activity. As much as it has to be a little thing that is going to make the customer say, huh, that was unexpected. Or, I didn't see that coming. Recently I found myself of a lobby of a corporate office and I was waiting for a meeting. And they had a power outlet box on top of one of the tables in the waiting room. And not only could you plug in your laptop or whatever device to a regular electric outlet, but they had a little hub of chargers. You know, I certainly noticed it. The iPhone charger was there and there were a bunch of other little dongles that you could attach and charge your phone with. And I thought to myself, this is a small investment. Less than $20. That they put in the lobby, that I guarantee, there are people sitting in the lobby waiting for a meeting who say, oh well that's kinda nice, I can plug in and charge my phone a little bit while I wait. To me the point is, what are those little interactions and we talked about the lobby, we talk about the bathroom. Think about the places in your office where guests visit the most. And think about making those places where you put your emphasis or focus. I've been to plenty of office buildings where they have a parking garage that it feels like no one in the business cares about. No one that has an office in the corporation cares about because the garage is maybe filthy, or it's not well lit. Or there's not clear signage. And as a result, if you're coming to visit ... I had this recently, I was speaking at an event and we show up to the parking garage and we park the car, and I have no idea where to go. I know I'm in the proper parking garage for the building that I need to be in, but because of the twists and turn within the garage, I can't get out. And what I figured out is you have to go down a level and then up two levels to get to the walkway into the building. But there's no way you would know that if you hadn't A: been there before, or B: did what I did, which was just hang out in the garage long enough until somebody was walking into the building who clearly knew what they were doing. So every touch point. Every interaction, especially if you have any type of a physical location is really something that you should be paying attention to. Dan: So I think the take aways here are pretty simple. The first is, if someone can make an experience out of a urinal, you can surely make an experience out of your business. The second is, customer experiences can occur absolutely anywhere. So think outside the box. Third, get creative. Sometimes it's the most unexpected experiences that are the most memorable. Joey: There's so many great customer experience articles to read, but who has the time. We summarize them and offer clear take aways you can implement starting tomorrow. Enjoy this segment of CX Press where we read the articles so you don't need to! Dan: This week's CX Press comes from Jennifer King of E-marketer retail. It's called Brands and Consumers Differ on What Makes a Poor Brand Experience. So In Moment surveyed 2000 US internet users and 1000 US brand professionals back in December. And the results show that brands don't seem to be in touch with what consumers are thinking. Joey: Shocking. One key finding in the survey was that nearly three quarters, 74% to be exact, of internet users, said that interaction with staff, whether it's a poor attitude or lack of knowledge, can lead to a negative experience. Meanwhile, brands significantly underestimated the real damage employees can do to their customer experience. Just 29% of brand professionals said that interaction with staff can contribute to a lack luster experience. So here's how that works folks, 74 % of the customers said that the staff can make a bad experience. And yet only 29% of the brands, the companies, felt that their employees could make a bad experience. That's a huge difference in the opinion between the customer and the brand. 41% of consumers also sited the ability of staff to help when needed; whereas, only 28% of brand professionals listed this. So basically there's a pretty disconnect between what the customers feel are the key movers in the overall brand experience, and what the brands feel are the key movers in the brand experience. Dan: Yeah and I though that it was important that this was really about the people aspect of the experience. Is that consumers are saying the people aspect is really important. And so the other staff has set out to me, this article was, that the lack of understanding of my needs and the product or service was not what I was expecting, both of those had big differences as well. The first one was 46% to 26% and then the second one was 40-27%. So this is suggesting, at least to me anyways, that brands are not taking the time to understand consumers expectations. Or, to help set those expectations if it is something that they're not able to deliver. So you've got the people aspect of that consumers are saying that people are really important and I expect the staff to be knowledgeable and have a good attitude and be available. But then also, I want them to understand my needs and my expectations so that they can meet or exceed them. Joey: I think this disconnect between what the customer is looking for or thinking, they're evaluating the in person interactions. Versus how the brands are evaluating the in person interactions. Probably speaks to a lot of the frustration that both parties actually have. I think the good news though is that most brands, while they may not place as high as value on the in human interactions, or the human interactions, not inhuman in a bad way, rather in person interactions. They do recognize that they need to do better. Last August there was a different survey of marketers who are asked about the ability of their company to deliver great customer experiences. Now what was interesting about this is it asked the survey respondents to rank their ability to deliver on customer experiences as excellent, very good, good but needs improvement, not very good, or doing a bad job. And I suppose the good news for customers everywhere is that the biggest category of responses, or the response that got the most answers, was good but needs improvement. We're meeting basic expectations but there's room for improvement. So the good news is 43%, almost half of the respondents felt we're okay, but we know we could be a lot better. The other categories just kinda evened out. And I think what this tells us is that there's at least some level of awareness within organizations, or at least within marketers, that they know they could be doing a better job. But I think in order to do that better job and to fix the customer experience, the brands are really going to need to understand the customer's expectations, be aware of what they want fixed, and at least based on the survey we talked about at the beginning of this segment, focus more on the people. Focus on the staff member who can help them find what they're looking for, making sure that the staff has a significant base of knowledge to answer questions, making sure that the staff has a positive attitude. That those things are actually what the customers are seeking and the brands are currently failing to deliver. Dan: So, Joey, I wanna did a little deeper into this because I've worked at three very large companies and you have consulted with many many large companies and worked for the government, which is the largest company there is. Joey: Its own brand issues. Dan: So I'm kinda interested in your thoughts on how it is that companies seem to be aware of the fact that they need to make change, but they seem to not be able to go and make the right change. I think that's really fascinating. Joey: I think it is. I also think, I don't wanna be hard on the larger companies, but I think in some ways it's indicative of the human condition. What I mean by that is, I know that a bag of Doritos is not a good choice for me. I know that I shouldn't eat Doritos. And yet, sometimes when I'm on the road, I find myself picking up a sandwich, you know at an airport sandwich place. And invariably, if they have Doritos, I'm gonna grab a bag. Now that's not be being critical of Doritos, before we get all kinds of people saying Doritos are bad. But it's definitely the case that, you know, a bag of Doritos is not the healthiest possible choice, and yet, I still like the way it tastes. And I still want it. And I think the analogy to the business setting is, often I think employees recognize that the experience needs to be better and could be better and should be better. But for whatever reason, they don't make that decision to be part of the solution. And I think part of that is not feeling empowered. I think that part of that is a belief that, oh well, that falls into some other department. Kind of the siloing of Corporate America. I think those things are contributing to it. When I think in reality, what most managers and business owners and leaders should be doing, is trying to instill a belief in all of their employees that everyone is in sales. Everyone is in marketing. And everyone is in customer experience. And so empowering people to take more responsibility for improving the overall brand experience. Dan: I think the word empowerment is right. 'Cause as you were talking, kind of what I was thinking, was many time you've got the CEO saying we have to have a better customer experience, right? 'Cause they're reading all the articles too. And they understand that this is something that they need to be focused on, but I'm not sure that when it trickles down to your daily workers that they feel any empowerment at all to change the experience. Or, if they do have empowerment, it is only in the little area of the world that they control, which is tends to be small because companies tend to be siloed. And often times as manager or even a director level only controls one little piece of the experience. So even if they could improve that piece, where the customer is coming from and where they're going to next, may still be disastrous. So I do think you're right that it is incumbent upon companies to make sure that everyone feels that they're part of the customer experience. But I also think that on top of that, you have to have somebody own it because too often what I've seen is when something like customer experience is everyone's job, then it becomes no one's job. It becomes half of 1% of everybody's goals and so no one pays attention to it. Joey: I definitely agree. And I think you're right, someone has to own it and the person who owns it needs to be high enough in the organizational hierarchy that they have status in the room and that they can have the ear of the CEO or the CFO and the senior management team. And really make sure that the voice of the customer and the customer experience needs are being heard at the top echelons of the company. Another thing I will say about this is, I think many leaders have a presumption that their employees know what good customer experience, or great customer experience actually is. I found myself in a scenario recently talking to a CEO where he was saying, we want Ritz Carlton service. We want First Class service. We want White Glove service. And I said, okay well that makes sense. And we got the whole team together in a room, and I said, alright so the CEO has said that they want Ritz Carlton service, First Class service, White Glove service, have you all heard that? Raise your hand if you've heard the CEO talking about this? And all the hands went up in the room. And I said, okay, and the CEO's kinda looking and smiling. I said, alright, now here's a question, how many of you have every spent the night in a Ritz Carlton? And the CEO proudly raised his hand and the CFO raised his hand, and not another person in the room raised their hand. Joey: And I said, well okay, well how many have you have flown First Class? And again the CEO and the CFO raised their hand. And now the head of sales raised their hand, but no one else raised their hand. And I said, okay one last question, how many of you have eaten at a restaurant where your food is delivered on a tray by someone wearing white gloves? And again, it was the CEO and the CFO. And I turned to the CEO and I said, it's really difficult to expect our employees to create remarkable, amazing, world class experiences when they've never experienced them themselves. And I think that is a piece of the puzzle that many manger overlook. We're asking our employees to deliver these fantastic experiences, when the reality is, the bar for customer experience, as we've talked about on this show many many times, is lying on the ground. And so the average employee doesn't have a library of amazing customer experiences that they've personally been witness too and partaken of. Maybe they've read about it or heard about it. But if you've never gotten onto an airplane and turned left, to go to First Class, and have only sat in coach or even worse, in the back row that doesn't recline, you know with your knees pressed up against your chest because there's no leg room; it's really hard for you to know the completely different experience of flying with leg room. With someone who calls you by name. With not feeling like you're sitting on the lap of the person next to you. So I think something we need to do as businesses is make sure that our employees are having the change, on a pretty regular basis, to sample those types of experiences that we're hoping they create for our customers. Dan: Yeah I agree and I guess I would add on that is not every company needs to be like Ritz Carlton and needs to have White Glove service. And this is why I always advocate that you become a customer of your own business, if at all possible, and then just sort of use your own common sense in terms of what you like and dislike about other experiences. Right? If you've ever shopped at Amazon you know it's easy. Well, if you have a website, go onto our website and see if you would also think that it's easy. I don't think that every experience has to be First Class, because it depends on what business you're in. But the reason why those companies are often sited, is because they do a great job thinking about the little details and making them perfect so that when you're in First Class, it's not just about the leg room, but it's about them calling you by name, et cetera. I think if you can become a customer of your own business and you can take whatever your experience is dealing with other companies and whether you sit in Coach or sit First Class, you've had experiences on an airplane. Take those experiences and try to apply them to your own business. So I'm gonna jump to our three takeaways. The first is, that brands must talk with and listen to their customers to understand their needs and their pain points. Because obviously, the whole point to this story is that there's a big discrepancy between what companies and what consumers think need to be fixed. The second is that customer service remains a key piece of the customer experience puzzle. As this survey showed, consumer's feel that the interactions that they have with people at your company are some of the most important in determining whether they have a good experience or a lackluster, love that word, experience with your company. And finally, the third is that understanding that you need to do better is the first step. So, it's nice in that second survey that most company executives realize that improvement needed to happen. So the first step is always acknowledging you have a problem. And then the steps that you take after that, are going to be critical to changing the outcome. Joey: We love telling stories and sharing key insights you can implement, or avoid, based on our experiences. Can you believe that this just happened? Dan: So Joey, I don't know if you know this about me, but I'm a big Cubs fan. Joey: Really! Are you a fan of the Chicago Cubs, Dan? Dan: Yeah, the World Champion Chicago Cubs? Joey: The World Champion ... I'm sorry I forgot to use their modifier. The World Champion Chicago Cubs? Dan: Indeed, I am a fan. I'm also a fan of their future Hall of Fame manager, Joe Madden. And one of the things I love about Joe is he has all these great mantras that he shares with his players. And I think that if you put them all together, he's actually gonna be a business consultant one day because all of his baseball mantras work well in business. And my favorite one, and I think listeners have heard me talk about this before, is do simple better. And I think that is such a great mantra. When he's talking about baseball he's talking about when you hit the ball, run hard to first base every time because you never know what's gonna happen. The Fielder might bobble it, or whatever it is. So do the simple things that you can control better. And I think that's a terrific expression for customer experience. And I was thinking about this when I was at an Italian restaurant in Chicago called Osteria Via Stato. Dan: It's very fancy. No, it's not. It's a great Italian restaurant. It's part of the Lettuce Entertain You chain, which owns about, I don't know, it's got to be like 50 restaurants in the Chicago area. And they're known for great service. They're known for huge portions. And they're really known for, frankly, a great experience. But this was a little thing. And when I think of, do simple better, I often think about the little things that make a big difference. So at Osteria Via Stato there are two sides to the restaurant. There's an Osteria side and a pizzeria side. And those two sides are big dining rooms each one of them. It's a very busy place. And they're separated by these two wooden swinging doors. I'm gonna post a picture of this on our show notes at Experiencethis.com, so you can see them. 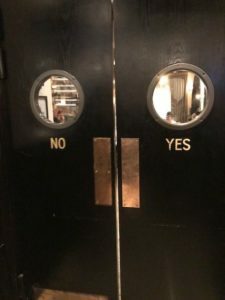 There are these two swinging doors and one of the doors says the word "yes", and the other door says the word "no". And I absolutely love this because it was pretty obvious which way you were supposed to go through. Right? And what I thought was so interesting was, how many times have you, or somebody you know, or someone [inaudible 00:27:20] been standing in a door, pulling pulling and then you look down and it says, push. Right? Or you're pushing pushing and you look down and it says, pull. And as I was thinking about it, I was thinking that the words push and pull, they're both four letter words, they both start with "p u". And it is possible that our brains kinda jump to a conclusion too quickly and that is one of the reasons why you see people doing that so often. Whereas yes and no, are so easy to understand. And I sat there and watched these doors. And you know what? No one made a mistake and no waiters crashed into patrons and no patrons were sitting there not knowing which side to go in. It was completely obvious and I loved it just because it was so incredibly simple, that it was doing simple better. Joey: Absolutely. I mean, I think when we think of the push/pull, I've always wondered why do they put push handles on pull doors. And it sounds like this is a nice solution to that. Right? That we're gonna be able to say yes or no. And the way you describe the doors, it sounds like they're swinging doors in a restaurant so, I imagine people are moving through those doors rather quickly. And the likelihood of a door flying open and slamming into someone carrying food, going between or just walking between the two sides of the restaurant or the Osteria and the pizzeria, is probably pretty high. So that idea of having it say yes or no, I think is actually quite brilliant. You know I found myself in a hotel recently, down in Austin. At the W Hotel, I was there attending South By Southwest. And when I went into the hotel ... and I'm a Starwood guy, I love staying in Starwood hotels. And when I walked in, I noticed that on one of the light switches right next to the front door, someone had done a print out label on the switch that said, master. And I spend enough times in hotels, I know you spend a lot of time in hotels as well, Dan. That having a single switch that turns off all the lights in the room, is kinda a powerful and useful thing. And it's also certainly environmentally conscious. It makes navigating the room a lot easier when you come back at night and being able to just power up all the lights in the room at once, or power them all off. And I thought that was pretty cool. What I happened to notice as I got settled into the room and started to get ready to do some work, is I couldn't find the power outlet at the desk for my laptop. And I'm looking around on the top of the desk and I'm looking to see if they have one of those, kinda fancy light fixtures where they have the table lamp with the outlet plugs on the base of the lamp. And I'm looking around and I'm not seeing anything. And I kinda push my chair back a little bit and I see on the desk, written the word, down a little bit lower, outlets. As it turns out, the power outlets were under the desk, but not on the wall. Actually under the desk as part of the desk. So kind of a weird location, or a non-obvious location, but the W Hotel had decided to put a little sticker that would point guests in the right direction. Now if any of our listeners, you not stayed at the W, they hold themselves out and really, I think, deliver on this experience of being kind of an upscale, hip, modern hotel with high fashion sense. And so I imagine there was someone that was a bit frustrated that they would put stickers saying, master or saying, outlets, on the furniture and on the light switch. But the reality is, as a customer, I found both of those things to be very useful because they adopted that philosophy of doing simple better. Making sure that the little basic obvious things, they really delivered on those. Dan: Yeah and if you take it a step further and you said it very well that in the restaurant the reason for the yes/no is to prevent either customers or staffers holding big trays of food from getting crashed into and injured and food falling on the floor. But in the hotel, you're probably reducing phone calls to the front desk of where the heck are the outlets? And they probably got enough of those phone calls that they finally said, you know what, we've got to proactively tell people where the outlets are because it isn't obvious. And those are both great examples of doing simple better. Joey: That's useful. Your baggage claim is, never. Joey: You have no baggage, you will not get it from anyone. Dan: You know, the technology's probably good enough that if they don't have the baggage claim number they could set it so that it just doesn't send the text, but instead they send the text without the number. And that's not doing simple better, right? Because that should be a pretty simple fix. So, anyway, Joey, I'm gonna send it over to you to do our take aways. Joey: Alrighty. So our take aways, number one, we've got to go back to the manager of the Cubs and do simple better. Right? Keep it simple. I'm not a big fan of the keep it simple stupid model, right? But just that mantra of keep it simple. Wherever possible, reduce the number of interactions. Reduce the friction point. Get down to the basic things that are needing to happen. Let's be candid, we've got a lot going on in our lives as human beings, both your employees and your customers. And wherever we can simplify is gonna be a good thing. Number two. Simple is good for everyone. You know, I told the story about the outlet sticker at the W Hotel in Austin. And Dan brings up an excellent point, that's gonna reduce calls to the front desk saying, I can't find the outlet to plug in my laptop. So, when you use techniques that lean towards more simple solutions, it actually frees up more time for your employees because they're not needing to explain things that are more complex in nature. And as a result, it gives them the opportunity to focus more on serving and creating experiences instead of troubleshooting. Number three. Put yourself in your customer's shoes. Okay. They're novice. They're new to your brand. They haven't stayed at your hotel. They haven't been in your office. This may be the first time to your restaurant. Make it easy for them. Do more hand holding. Make sure that the customer feels comfortable navigating through the various aspects of your business. And if you do keep it simple, and you do make simple better, you will have a remarkable customer experience. Dan: This week's number is 45%. Joey, what do you think it means? Joey: I'm gonna guess that 45% is the number of people of the Irish bar on Saint Patrick's Day going bonkers, who are actually of Irish descent. Dan: Wow. I think that's number probably high. Dan: Good guess. Actually 45% represents the percentage of attendees from a recent Oracle CX webinar who believe that customers want them to do a lot, and, that those expectations are not unrealistic. And what was interesting is that 11% felt that their customers want them to do a lot more than is realistic right now. Joey: So, let me make sure I understand this. 45% believe that their customers want them to do a lot, and the companies agreed that that's not unrealistic. But 11% believe that customers want them to do more than is actually realistic? Dan: Correct. And I think the 11%'s probably also closer to the number of people in the bar who are actually Irish, but I'm off track. I can see this. I think there is ... this reiterates the point that we made earlier in the show, which I'm guessing might be why this was a statistic you picked, Dan. That the customers are expecting a lot and businesses recognize, for the most part, that those expectations are not unrealistic. Meaning, the business realizes it could be doing more and so if that's the case folks, and we recognize almost half of people recognize that we could be creating better customer experiences. Maybe we should stop talking about it and stop thinking about it, and start doing it. Dan: I couldn't agree more. And this stat, by the way, is brought to you by our friends and sponsors at Oracle CX Cloud. 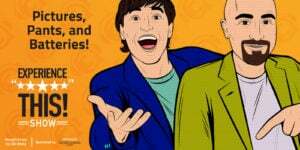 Dan: And there is still time to sign up for their Modern Customer Experience Conference, right here in Chicago, Illinois, April 10 through 12. Does your company meet the expectations of today's empowered customers? Are you leading business transformation? Or stuck trying to catch up? At the Modern Customer Experience Conference you'll hear success stories from companies just like yours. Have the opportunity to go one on one with Oracle experts and to improve your skills through hands on demos and workshops. Go to Oracle.com/moderncx to register for the Modern Customer Experience Conference, Chicago, April 10 to 12.